Change your Brain, Free Yourself from Pain. Somatics, the Easy Way to Live Comfortable for the Rest of Your Life. Athletes are discovering new ways to release tension, stiffness and pain. Somatics exercises, which are the complete reverse to most approaches out there, help athletes turn the corner so the usual icing, ibuprofens and hot tub can go bye-bye. Want to know what’s it like to be a somatic athlete? Check out our somatic athlete series. Who knows, you may give up the ice, heat and even that athletic tape now in vogue. The book, Move Like an Animal: Feel Comfortable, Be Flexible, Move Well for Life in 3 Simple Steps on Amazon is free this weekend. Discover how the simple animal act of pandiculation is a profound natural ability we can rekindle through the easy to do somatics exercises. When simple movement is done with a certain awareness we can release tight, stiff muscles which may be kept at bay guarding or holding on well too long. We can change the signal of “holding on” to letting go which allows us better mobility, easier flexibility thus changing pain into comfort. Our brain and nervous system can handle the rest when we mindfully and easily work with our natural living process. No drugs needed to create powerful chemicals or relaxation. All you need is yourself and a little reminder to update your movement software back to levels of comfort you remember feeling in your youth. As we age, we can feel better and move easily. “Here you will find exercises unlike anything you have ever done. Mr. Barrera has numerous exercises in his book that he demonstrates and teaches you how to do them. There are also some video testimonials from people he has worked with that have seen dramatic results from his training. 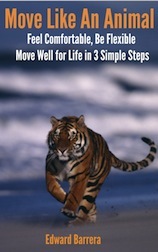 Move Like an Animal: Feel Comfortable, Be Flexible, Move Well for Life in 3 Simple Steps. Get the book now. The cat stretch series is made up of 7 simple movements, well there are 11 parts to it. Just like a cat or dog who does its morning routine to wakeup the nervous system and muscles, we can do the same with just a few simple moves. Simple back exercises done at home ready us for the day ahead. When we begin our day with easy movements, we might just end up dancing our pains away. Are you thinking help me get to sleep? Zzzzzzzzzzz’s. Are you getting enough in? There was a time when I awoke 60x per minute. Crazy right. No wonder it felt like a mack truck was running me over each week. All that is different simply by doing a few somatics exercises to get the muscles to calm down, then rest comes easy. Join our online class so you won’t have to think help me get to sleep… you’ll have the natural tools to zzzzzzzzz and stop and all the tossing and turning. Gives us the ability to get out of muscle spasms too. You can learn to get out of back pain for free. Animals move quite well. How are they able to do that while we human animals are plagued with stiffness, immobility and a loss of natural flexibility as we age. Try this move down below and get your art of movement and moving well… back on track. It only took a few steps before I used to feel the pains in walking. Living with chronic pain was no fun and even though I attempted to exercise, trying to do the right thing… I would pay a price. Eventually I learned how simple movements using the mind would be a way I could change the pain. To find out for yourself: you can get some free audio classes and discover a new way to move easily. You can join us online where you'll get to learn how to take care of your back, neck, shoulders, arms, legs, hips, feet, ankles, etc. Are you ready to rid your pains in the back, neck, shoulders, arms, hips, legs, knees, ankles, feet, etc? Gravity Werks Comprehensive Program Made Just for You. Ed is the Author of Amazon Bestseller, Move Like an Animal,, a certified Hanna Somatic Educator® with 14 years of experience helping people overcome physical pain, reducing muscular stress & tension, and recovering quickly from injury. He is also a certified Resistance Training Specialist (RTS1) and Muscle Balance and Function Development® Trainer. He also works with horses. Defined as your body experienced from within, by Thomas Hanna. The word soma is a description of the flow of the sensations that occur within all of us. The somatic viewpoint comes from your experience of yourself-the acting, sensing being. And this experience is a sensory-motor event. Sensing and moving are intertwined and cannot be separated, however, what we do not sense, we cannot move and what we cannot move, we cannot sense. then you will experience the freedom in movement and sensing you always thought and knew is possible for yourself. Thanks Ed - ... great news - I've been doing a lot of cross country skiing here in Minnesota where the weather is cold and clear and the snow sparkly and dry. And my stride and balance are light years ahead of where they were last year at this time! Not to mention my stamina - it's all pretty effortless and most of all, great fun! I have been meaning to write you this for a long time. I have not returned to you for more work because for all practical purposes, my back no longer bothers me. I cannot tell you how grateful I have been toward you over these last few months as I began to realize how much better I am. Within a month of working with your exercises I was markedly better, and after six months as I began picking up the exercises on a regular basis, I considered myself virtually cured. I have to say that when I read Hanna's book and the testimonials from Somatics people about how miraculous it seemed, I was skeptical. They seemed frankly ditzy. But now I are one! Just wanted to let you know ... while making a transfer of a patient who unfortunately died in my arms ... I was caught in a very narrow space and we were stuck for 5-7 minutes. Had to call 911 for assistance. Since I was using all of my muscles to hold up the patient, I didn't have any room to step back and the paramedic had to pry me off of the patient. Immediately afterwards I felt a burning in the muscles of my chest... eventually I went to Urgent Care. The PA recommended I take off the next couple of days and recommended I do not do any exercise, but use the muscle relaxant and pain medication. He wanted to let the muscles rest. Thanks Ed. I'm having a bit of a hard time keeping up with the somatics classes - mostly for a good reason though, my back has been doing a lot better and I've started dancing again! Anya. Victoria, B.C. I am another of your success stories--after the 4 hour class on June 28th. On July 2nd I was on a plane to Alaska, and a 12 day whirlwind trip around Anchorage and the Kenai Penninsula by car. I was pain free and full of energy--while I kept doing my 3 favorite back movements! I called the neurosurgeon and canceled a scheduled back surgery on my return home!